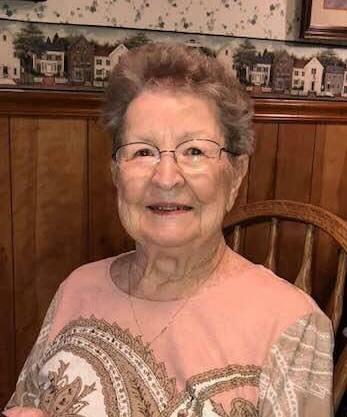 Dorothy Marie Kendall Griffith 93 of Lloyd went to be with the Lord on Tuesday, March 19, 2019 at Kings Daughters Medical Center in Ashland KY.
She was born in Ashland KY on March 19, 1926 a daughter of the late Travis Womack & Dorothy Dempsey Kendall. She was a lifelong member of the Greenup Christian Church where she taught Sunday school and was the former choir director; a member of the Greenup Women’s Club; a law secretary; a WSAZ hometown hero; she was inducted as member of the Greenup County Schools Hall of fame; she loved to fish and was an avid U.K. Wild Cat fan. In the early 60’s at the request of Jesse Stuart, Dorothy co-founded the Greenup County Public Library System and went on to serve as the director for many years. She was preceded in death along with her parents by her husband of 62 years Paul Raymond Griffith; a daughter, Cheryl Ann Brammell and a brother Travis Joe Kendall. She is survived by two sons, Paul David Griffith and his wife Nancy of Flatwoods and Gary Joe Griffith and his wife Karen of Lloyd, six grandchildren, Scott Griffith of Cincinnati, Laura Brammell Donta of Lexington, Emily Griffith of Royal Oak MI, Darren Brammell of Grayson, Kendall Griffith and Zachary Griffith, both of Flatwoods, two great-grandchildren, Jacob Donta and Brooklyn Brammell. She is also survived by a son-in-law, Keith Brammell of Graniteville SC; a sister-in-law, Mary Lou Grifffith Kendall of Greenup, and two nieces, Jamie Garthee of Greenup, Mari Jo Ferguson of Versailles, and a nephew, Michael Kendall of Greenup along with a host extended family, her church family and co workers. Funeral services will be 11:00 AM Saturday March 23, 2019 at the Greenup Christian Church by Brother Mike Dennis. Burial will follow in Bellefonte Memorial Gardens in Flatwoods Ky.
Visitation will be from 6:00 till 8:00 PM Friday at the church. In lieu of flowers donations may be made to the Greenup Meals on Wheels P.O. Box 382 Greenup KY 41144 or the Greenup Christian Church 711 Main Street Greenup KY 41144.